#1 New Release in Computer Simulation on Amazon! Everyone needs a refresher sometimes. 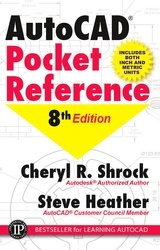 The AutoCAD® Pocket Reference, written by two of the foremost AutoCAD® expert teachers, provides quick and easy access to everyday information needed by AutoCAD users in the classroom or on the job. It includes all of the basic concepts, fundamental commands, and step-by-step instructions. The contents, pictures, explanations, and index are unparalleled by other references, as are the price and size. This 8th edition has been improved with the inclusion of both inch and metric measurements throughout to appeal to a more global audience, as well as updated screenshots of all the AutoCAD 2018 & 2019 commands readers need. And with the inclusion of special "CAD Tips" scattered throughout, this is the perfect "cheat sheet" referenceto to make the most of AutoCAD’s features and strengths..